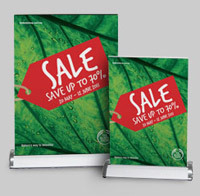 This table top mini display system is great for highlighting products, special offers and great as a promotional tool. Ideal for Point of Sale and Receptions. Looks great on a table or counter top. Full colour print on a premium satin paper.